One of my favourite places to stop for lunch is the Daddy Donkey burrito van on Leather Lane. They're not particularly cheap, but they make a wonderful Friday treat. My other half has yet to experience the joys of Daddy Donkey, and seeing as we had some tortilla wraps in the fridge and most of the ingredients, I decided it was time he got to sample what all the fuss was about! If you make all the components in advance, it takes no time to assemble - just a little skill and practice. The best advice I can give is to use the biggest tortilla you can find. I'll cover how to make guacamole and salsa another time. 4x flour tortillas - the biggest you can lay your hands on! If you have time, slice the chicken breast into 5mm slices and marinate it the night before. If not, just leave it for as long as you can before you need to eat. Once the chicken has marinated, grill or griddle it and then roughly chop. Put the rice on to boil for 11 minutes, then slice the onion and peppers - each about 5mm in size. Sautée the peppers and onion with the cumin and coriander powder until completely soft. Once the rice is cooked, drain then rinse and set aside. Once it has cooled sufficiently, stir in the fresh coriander, add a little black pepper and the juice of 1/4 of the lime and mix it all together. Make up the salsa and guacamole (recipes soon), shred the little gem lettuce and grate the cheese. In a hot frying pan, dry fry the tortillas for 15 seconds each to warm through, and then pile the ingredients into the centre: a handful of chopped chicken per burrito, two tablespoons of rice, a tablespoon of sautéed peppers, a handful of cheddar, a handful of lettuce and a dessertspoon of guacamole and sour cream. And here's the tricky part (but practice makes perfect, I assure you!) 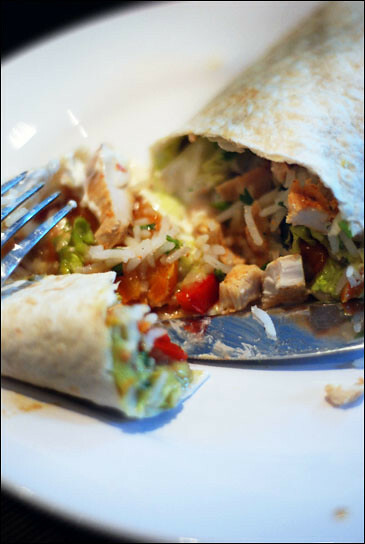 - tightly wrap the tortilla around the filling, and serve. Mine aren't as tightly wrapped as the delicious Daddy Donkey ones (yet), but if you're craving a decent fajita and Farringdon is that bit too far, this makes a suitable alternative. This is definitely my favourite so far. Looks/sounds so delicious. This was delicious crumbs for dinner! I was looking for a Mexican recipe for my husband so you made my dinner much easier and tastier! thank you, so glad it worked well!